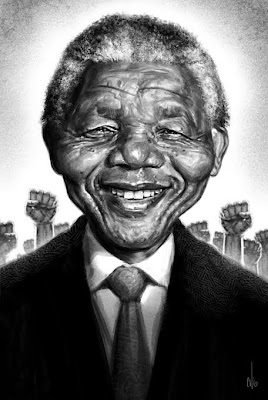 A fairly quick caricature of Nelson Mandela for this month's drawing contest over at Wittygraphy. This is 100% Photoshop using some of my custom brushes for textures. I'm usually pretty lazy when it comes to detailed finished paintings, so I pushed myself on this one to see how far I could take it. Shown above are the brushes used for this piece. The first is one of Photoshop's default brushes with some small tweaks, this did 90% of the painting. 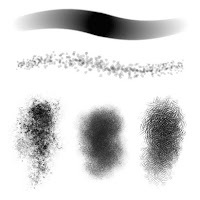 The second is also a default Photoshop brush, this was used for the initial layer of hair and it was also used with the smudge tool to blend the lines of the sketch. The bottom three are my custom brushes. The first one (from Set Three) was used for the final layer of hair and also some texture on the face and background. The second (Set Eleven) was also used on the background. The third (Set Three) was used for the suit texture. I know it seems like all I've been posting lately is girly art, (and this is mainly due to my contributions to 'The Attractive Art Community' blog) but I will have some other type of art to share soon. Come May I'll have a full colour Charlie Sheen caricature to share which I did for FHM magazine (along with an animated gif of it's creation) and I've been mucking around in my spare time redesigning Star Wars characters. So there'll be some non-girly art coming shortly. Somewhere on one of my blogs is a HIDDEN EASTER EGG link which will take you to a SECRET BLOG I've been posting on for the last six months! On this blog you'll find sketches, work related art and gifts for friends and family which for some reason or another did not end up making it to the main blog. Below is a little tease of the work you'll find on the hidden blog. 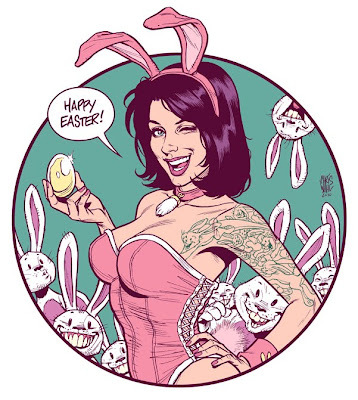 So, to tie in with Easter I'm issuing a CHALLENGE- an EASTER EGG HUNT! The FIRST THREE people to find the link and post a comment on the latest post of the hidden blog will win a FREE T-SHIRT of my design from my Redbubble store! After the winners have been determined, the blog will be revealed to everyone for the remainder of April. After that it will be hidden once again. So, get to it! Happy Hunting!! EDIT- COMPETITION IS CLOSED! Well, that was obviously too easy! The three winners have already been decided, I'll be in contact with them shortly to discuss prizes. EDIT- 1st May. April is over and the hidden Easter Egg blog has been renamed and rehidden again. Thanks to everyone who visited. Let the hunt begin again!